On the fifth day God created all animals both in the water and upon land. It was on the sixth day He created man in His own image and likeness male and female, and they were to have dominion over all creatures of the earth. (Genesis 1:26-28). And God said, Let us make man in our image, after our likeness: and let them have dominion over the fish of the sea, and over the fowl of the air, and over the cattle, and over all the earth, and over every creeping thing that creepeth upon the earth. 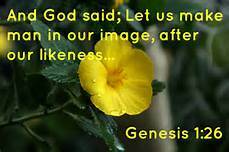 So God created man in his own image, in the image of God created he him; male and female created he them. And God blessed them, and God said unto them, Be fruitful, and multiply, and replenish the earth, and subdue it: and have dominion over the fish of the sea, and over the fowl of the air, and over every living thing that moveth upon the earth. It is written God is love and those who know Him dwell in this love (1 John 4:16). Therefore when we are in Him we are His sons and daughters, even though it be not recognized by those of the world and when He appears we will one day be like Him! (1 John 3:1-3). Behold, what manner of love the Father hath bestowed upon us, that we should be called the sons of God: therefore the world knoweth us not, because it knew him not. Beloved, now are we the sons of God, and it doth not yet appear what we shall be: but we know that, when he shall appear, we shall be like him; for we shall see him as he is. And every man that hath this hope in him purifieth himself, even as he is pure. Though any one of us die, if we be in the Lord we will stand before Him whole for He has conquered death for us all. (Job 19:25-27). For I know that my redeemer liveth, and that he shall stand at the latter day upon the earth: And though after my skin worms destroy this body, yet in my flesh shall I see God: Whom I shall see for myself, and mine eyes shall behold, and not another; though my reins be consumed within me.